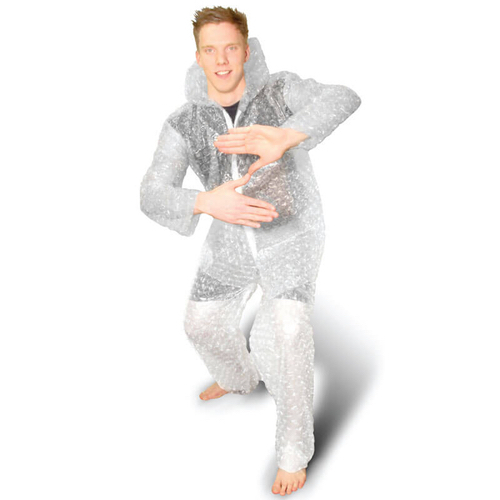 ​Whenever a package or parcel comes our way, we’re always more interested in the thought of the bubble wrap covering than the object itself – which is why you won’t be able to resist this bubble wrap suit, the ultimate in cool costumes! Great for parties, Hallowe’en and fancy dress. And inspired by a cult teen flick (we’ll give you a clue:“Dude, Where’s My Bubble Wrap Costume?”), the plastic suit is covered in air-filled bubbles – meaning you won’t be able to keep your hands to yourself! This awesome outfit consists of a pair of trousers and a hooded jacket, covering you in those pesky air pockets! If you’ve got a penchant for bubble-popping, you’ll love to pinch, nip and squeeze this suit and feel some serious satisfaction as those everyday stresses melt away!